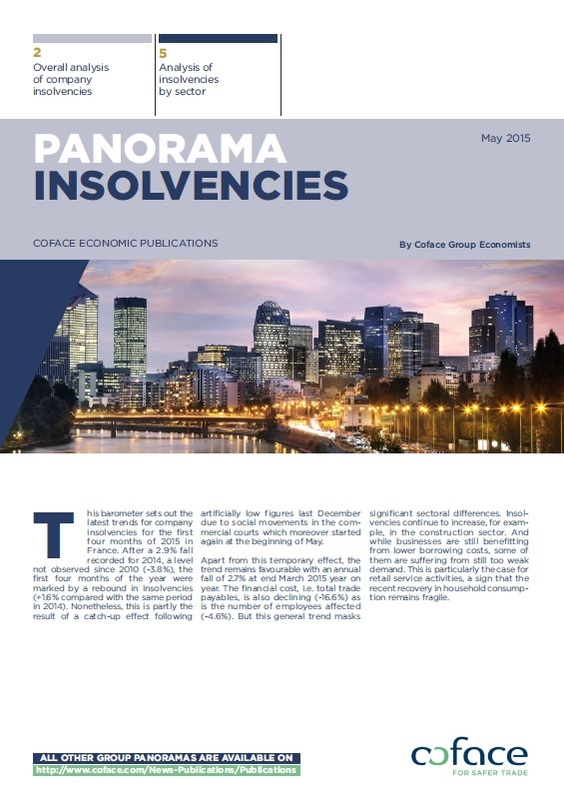 This barometer sets out the latest trends for company insolvencies for the first four months of 2015 in France. After a 2.9% fall recorded for 2014, a level not observed since 2010 (-3.8%), the first four months of the year were marked by a rebound in insolvencies ( 1.6% compared with the same period in 2014). Nonetheless, this is partly the result of a catch-up effect following artificially low figures last December due to social movements in the commercial courts which moreover started again at the beginning of May. Apart from this temporary effect, the trend remains favourable with an annual fall of 2.7% at end March 2015 year on year. The financial cost, i.e. total trade payables, is also declining (-16.6%) as is the number of employees affected (-4.6%). But this general trend masks significant sectoral differences. Discover the detail of the forecasts in this panorama.